Visualize this: until sometimes in the Nineteenth Century, GreenHouse Gas (GHG) concentration was 280 ppm (280 parts per million), including the man-made sort. Now we are close to 500 ppm, using a variety of exotic gases we produce industrially, among them, CO2. In CO2 alone we are at: Week beginning on March 20, 2016: 405.62 ppm. Weekly value from 1 year ago: 401.43 ppm. Weekly value from 10 years ago: 382.76 ppm. So the CO2 alone is augmenting at a bit more than 1% a year. Thus we will be at an equivalent of 550 ppm in ten years (including the full panoply of all the other man-made greenhouse gases, not just CO2). There is evidence that, with just 400 ppm, disaster is guaranteed. How Antarctica would appear if its ice melted: it’s half under the sea. Polar temperatures over the last several million years have, at times, been slightly warmer than today, yet global mean sea level has been 6–9 metres higher as recently as the Last Interglacial (130,000 to 115,000 years ago) and possibly higher during the Pliocene epoch (about three million years ago). In both cases the Antarctic ice sheet has been implicated as the primary contributor, hinting at its future vulnerability. Here we use a model coupling ice sheet and climate dynamics—including previously underappreciated processes linking atmospheric warming with hydrofracturing of buttressing ice shelves and structural collapse of marine-terminating ice cliffs—that is calibrated against Pliocene and Last Interglacial sea-level estimates and applied to future greenhouse gas emission scenarios. Antarctica has the potential to contribute more than a metre of sea-level rise by 2100 and more than 15 metres by 2500, if emissions continue unabated. In this case atmospheric warming will soon become the dominant driver of ice loss, but prolonged ocean warming will delay its recovery for thousands of years. Notice that the scenario evoked in the last sentence is different from my very old scenario, which is similar to the one advanced in November 2015 by the famous Hansen and Al. (I raised the alarm before Hansen, at least seven years ago). In my scenario, and Hansen’s the ice sheets melt from below, due to warm sea water intrusion. The West Antarctic Ice Sheet is larger than Mexico. And notice again: When CO2 ppmv was at 400, sea level was up to 30 meters (100 feet) higher than today. And now we are at 500 ppm, and, in a blink, in ten years, at 550 ppm. Here is another example from the paper. I said all of this before, but to have scientists paid to do research in this area write it black on white in the world’s most prestigious scientific magazine, will no doubt endow me with greater, and much desired, gravitas. So let me indulge, not so much for my greater glory, but because it should help taking what I have long said more seriously. I said it before. Including the details. So the evidence was clear, and out there. The optimism (it will take 5 centuries for 50 feet of sea level rise) is not supported by evidence. Actually collapsing channels coming from inverted rivers running up on the bellies of ice sheets are now obvious on satellite pictures and collapse of major ice shelves is going to be a matter of years, not centuries. But science is made by tribes and these tribes honor the gods (of plutocracy) who finance them, and their whims. So they don’t want to make their sponsors feel bad. So they say unsupported, optimistic stuff, contradicted by a first order analysis. Science is good, metascience, better. Metascience includes the sociological reasons which explain why some scientists will take some “facts” for obvious (although, coming from another sociology, they are not). Deep in the Nature paper, in the quote above, or in four drawings and graphs of future sea level rise, one can find projections according to what various models “predict”… 130,000 years ago (!) The “Old Physics” model predicts one meter rise of the sea (this is the official UN maximal prediction for 2100). The new model, again starting with the present conditions, predict more than a six meter rise (!) This is a case of metascience playing with sea level. The question is not whether we will be able to avoid a twenty meter sea level rise: that’s, unbelievably, a given (barring unforeseeable, yet imaginable technological advances to extract quickly a lot of CO2 from the atmosphere). The question is whether we will avoid a 60 meter rise. 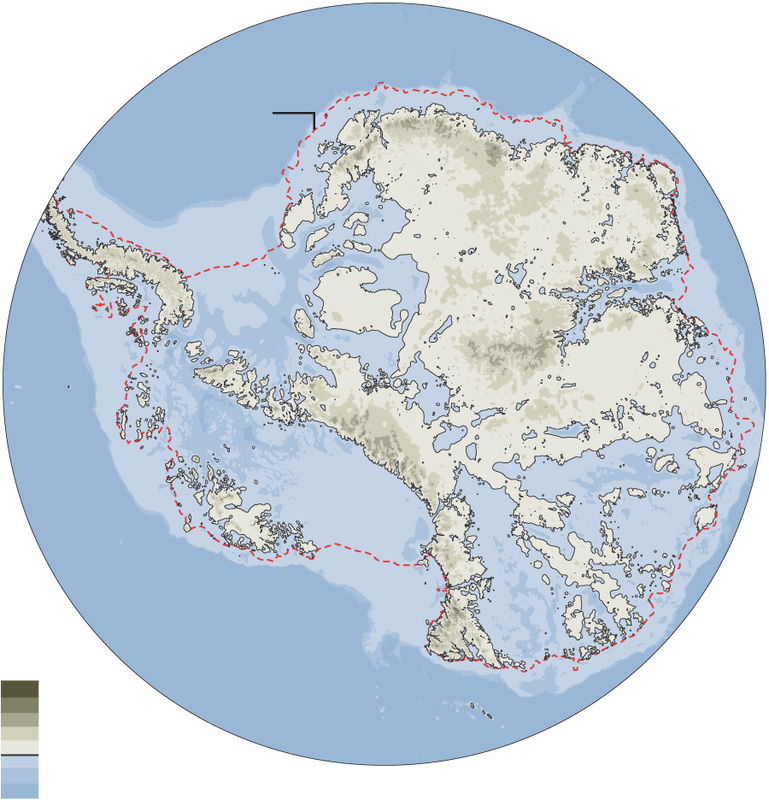 This entry was posted on April 1, 2016 at 10:58 pm and is filed under Antarctica. You can follow any responses to this entry through the RSS 2.0 feed. You can leave a response, or trackback from your own site. Again, I would value your permission for me to republish in full over at my place. Thanks Patrice. Same at this end but for very different reasons, I’m sure. Here the arrival of fine weather is drawing us outside for much of the day. Yes, I wished I could play in nature outside. Not the case. I am fending off social functions, right and left. Nothing like outside wilderness. And being republished tomorrow. Thank you. Hope you get a moment to cross over to my place and read the comments coming in! Strictly speaking, we have passed 400 ppm CO2, but we have a way to go to 500, but that is actually irrelevant. At the moment we are not at equilibrium: there is a net heat input and net ice melting, so we shall not stop melting ice until either we reduce the energy input or reduce the CO2 levels. I suppose some means of piling more snow onto the ice shelves would also lead to a gain. Unfortunately there are a lot of noisy climate science deniers, who probably live in the Republican areas of the US, which are largely in the middle and unaffected. After all, Denver is fairly safe from sea inundation. Patrice takes into account the other man-made gases, known collectively as GHG. She has said this a zillion and a half times in the past, and it’s featured in her present essay prominently. Some MIT professor announced the total GHG was 478 ppm, in 2012… If you do the math, we are above 500 ppm now. Megadeath is the friend of Pluto and its plutocrats. I know Paul.. the facts that Patrice brings should be making everyone of us alter our habits.. Yet why is it that there are those countries still flouting their emissions ? While the little folk get Green taxed? on Bills and hidden Green taxes? I have come to the awareness that this world WILL change its form.. For many parts will become submerged including most probably where I live.. As we are not high enough above certain sea levels.. I do what I can to help with my own footprints upon our Earth..
What tell me is the answer when those who rule turn a blind eye to what will eventually happen?.. When so many are shouting loudly for them to listen ..
“When so many are shouting loudly for them to listen ..” Yes, Yes and Yes! Which is why we little folk, in every way that we can, have to make it clear that what is going on by those who supposedly rule us is unacceptable. Make it so clear that our noise even drowns out there inner thoughts! Hi Sue, thanks for the comment! The powers that be tell us WE have to change. Yet, in truth, THEY have to change. Them and their laws (the laws Congress and the like impose on us). A CARBON TAX is both necessary AND SUFFICIENT, to change everything. Composting, zero waste in packaging, going vegan, will not change much of anything. But a CARBON TAX will change everything. It’s not just that we will get a much more efficient economy. Using CO2 industrially, extracting it to make stuff, just as plants do. So what we can do is what Paul is doing, namely fostering political, social and economic change, first, by making people aware of the disaster at hand. And ultimately, a carbon tax will come from political change (as I said in my reply to Marg, people can vote Sanders…) It better come really soon… As I said, the melting of a third of Antarctica is a given at this point. The choice will still have is whether we will stop there. We better. Greed, apathy and wilful blindness have brought all this about – and many of the other problems facing life on Earth. We have all become so used to our present lifestyles and I doubt that we’ll be able to change in time. Presidential candidates like Trump and Cruze, both climate change deniers, offer no hope on this score. Hilary may say a lot but is in the hands of the corporates. It’s easy to get very despondent. However, I must say that probably the main thing in my life which lifts my spirits and gives me joy on a daily basis, even more than my family, are my pets, especially my No. 1 buddy, my Jack Russell cross. Trump, Cruz and Hillary may be hopeless as far as being completely oblivious to the greatest threat to the biosphere in 66 million years (especially the latter two, as they depend upon fossil fuel plutocrats to satisfy their astronomical, Trump-like, greed). However Bernie Sanders, with a much longer political career that those three (together!) is definitely not in the pockets of those who want death and destruction for all of life to satisfy their denial of the human condition. Thank you for your reply Patrice. I agree we so need to educate on Zero waste and packaging.. And that those at the TOP are the ones who need to comply and change .. So pleased you mentioned going Vegan too:-) If we were all educated more upon what the Cattle were contributing to the environment.. Maybe our eating habits and intense farming of meat production would be altered.. As it is most are unaware just How Cattle are affecting greenhouse gas’s.. The world’s problems is all of our responsibility. And we each have to do what we can to help conserve and save our environment. Many thanks for your response and the awareness you bring. The problem I see is that our great leaders have incredibly more power than us. At our scale, we can engage only pathetic small efforts. At the level of the great leaders, giant efforts are possible. Simplest example? A hefty carbon tax (compensated by subsidies for the poor). That would force a virtuous lifestyle. For example I know people who jet around the world. For no good reason, except they can. So make air travel more expensive (especially for the wealthiest, by taxing corporate/business flying much more). France actually tried that for more than ten years, but it just penalized Air France, as no other country followed. Hi, Patrice. This blog post has been a work-out for the under-used grey matter between my ears. However, if you are asserting that the authors’ conclusions are not supported by the evidence presented in their own article, should you not be asking the the corresponding author why this is so? Also, who are the mysterious sponsors that you claim the authors are trying to placate by hiding the real implications of their own research? Therefore, in the 500 year time scale considered by DeConto & Pollard, I agree that >50m sea level rise would seem inevitable if MISI and MICI become unstoppable. Thanks Paul. Thanks to your site, Martin and I came to know each other several years ago. I am on Lack of Environment mail list. Martin depicts himself as a conservative, but he still believes he is in democracy, and can write to higher ups, as if his ideas matter to them. It is charming. I have a ready answer to the comment he made inside his comment. It’s always the same: if scientists draw the correct conclusions, they will lose funding first, their career next. I know I am wasting my time writing letters to David Cameron; and I know my opinions are irrelevant. However, the facts of history are not; nor will they be in the future. OK, David’s wife, officially, has a fund of more than twenty million pounds…. For the record: I am socially-conservative (i.e. as opposed to liberal) but under no illusion as to the folly of what has been called ‘money fetishism’ (Karl Marx); and ‘growthmania’ (Herman E. Daly). Hi Martin, thanks for the comment. I spent a whole hour reading the hard cover version of the paper the electronic version of which I criticized above. It’s quite a bit different. They use RCPs (Reasonable Carbon Projections, or the like in meaning). Yet, they don’t explain what they consist of exactly. All I know is that we are around 500 ppmv, and they work with 400 ppmv, in the 130 K-115 K years BP, when orbital conditions were cooler than now. Plus we are going to be at 550 ppmv within ten years, at the present rate. The earliest date they have for the failure of Larsen C in their worst RCP 8.5 is 2055 CE. I would be surprised if it did not fail within ten years. However, the paper version is more insistent on the danger of AIR warming, not just subsurface. If one wants to be taken seriously, one needs to please the powers that be. An academic who goes seriously against the established order will get immediate problems, especially in the USA. American academics are very dependent upon short term money, and most of them, these days are not tenured (moreover the departments they depend upon have very unstable funding, or even existence). This is why the potential catastrophic melting of Antarctica was not considered a serious possibility by academics until 2015. Now things are changing: dramatic Antarctic melting is suddenly viewed as a possibility within centuries. As far as I am concerned, dramatic melting will occur within a decade. David Cameron is in trouble (as should be the Argentinian president, Macri). For stashing secret money, and escaping taxation. The main problem is that this could have a dreadful impact on the silly referendum about whether Great Britain is in Europe, or not: David supports the idea that Great Britain is in Europe, but his credibility has collapsed! Put a frog in increasingly hot water. At some point, it will jump. The climate is jumping: all over Greenland a few days ago, the temperatures were 20 Centigrade above normal. Winter has been persistently 5 or 6 degrees C warmer than normal in the Arctic.